The machines are characterized by high speed and the best parameters. The control system is located in a separate, freestanding cabinet, so it is not exposed to damage and disturbances related to the operation of the device and also makes operations much easier for customer . All axes are driven by the latest Schneider servo motors, which are characterized by high accuracy and very high durability. The device includes an efficient laser, auto focus, stable CypCut software with NESTING function (automatic optimization of project placement on the material), dual cooling system, voltage stabilizer, lubrication system and dust extraction system. Use of heavy construction, made of high-quality metals alloys and submiting device in the process of long-term and special treatment causes the resulting stresses in the material to degrade, significantly reduces vibrations, shocks and shakes, making the AM series characterized by high stiffness, stability and shock resistance and the processed materials retain the given parameters. All of Weni fiber lasers are equipped with Auto Focus as standard. This function can be used for different focal lengths which are controlled by laser control system. The focal point will be automatically adapted in the cutting process in order to achieve the best cutting effect of metal sheets of different thickness. In practice it means the change of the thickness of the processed material by the operator, without re-setting the focal length manually. We do not need manual adjustment. The focal length is controlled by the operating system which effectively prevents the errors or failures caused by manual operation. Increasing the focal length of the perforation. Separate settings of focal length of the perforation and focal length for cutting makes the cutting more precise. Auto focus. 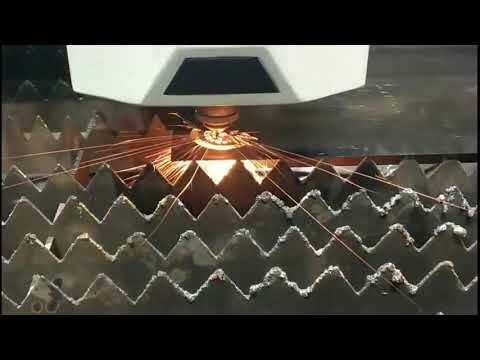 Automatically adjusts the most proper focal points in the process of trimming and cutting which significantly improves the speed of cutting. Built-in double cooling water systems provide fixed laser optics temperature which prevents the lens from overheating and extends their service life. Protective and collimation lenses carefully protect key components. The H series operates the length of pipes and profiles up to 6000mm, where after process only 15cm of material is left for Φ > 80mm in the rear clamp. The device uses the most accurate possible cutting methods, material guidance and control system. The material is attached by means of a sliding rear handle and guide front handle. The clamps in the spindle holders are pneumatic, which significantly speeds up the loading and handling process. The values ​​given are only illustrative. IPG Photonics is a leading producer of laser generators in the world. Years of experience guarantee the highest quality and the best parameters of laser beam. Broad distribution network and maintenance facilities guarantee perfect technical support for our products. Warranty and post-warranty repairs are implemented by the laboratory in our plant. YLR series laser generators are available in versions from 500W up to 2000W and YLS series from 2000W –up to 12000W. Wuhan Raycus Fiber Laser Technologies Co., Ltd. is the leader in production of laser generators in the Asian market. Wuhan Raycus has an international team of specialists conducting development research, which enables to improve and develop laser generators. Service and technical support departments are a big advantage of the company, and all the repairs of equipment are conducted directly at the client’s place. RFL series laser generators are available in the version from 500W up to 12000W. The Lexium servo-motors series includes LXM AC servo drives that work with BCH2 servo motors. Lexium servo drives and motors are part of MachineStruxure. Schneider Electric’s latest generation of MachineStruxure TM is an intuitive machine automation solution with all the features you need to improve productivity and increase your profits. MachineStruxure is a complete solution for machine manufacturers, providing benefits throughout the entire life cycle of the machine. The nesting technique (Nested Based Manufacturing or NBM) greatly shortens and improves the manufacturing process, in particular when it comes to curved cuts. The possibility of whole sheet plates positioning enables to use raw material more efficiently, which means reducing the amount of waste. Nesting enables optimal material use, and the function of cutting simulation allows to plan the production adequately. / Production planning: Before performing appropriate processing, the simulation function shall determine the time needed for conducting the task. saving and editing the graphics in *.lxd, *.dxf formats, as well as other formats on the basis of control system. There is a possibility of synchronizing the network with a personal computer and retrieving information from any media. Voltage stabilizer (three-phase voltage regulator) has been designed in order to protect and provide high quality of supplying WeniSolution brand laser devices. Equal and constant voltage without interferences is the basis of proper operation of each laser. It greatly improves the quality of cutting and the performance of laser generator. AirTAC company is the producer of power pneumatics components producer being part of pneumatic systems, such as air preparation sets, wires, joints, distribution valves, as well as actuators, which are servomotors, linear and rotary drives and end-effectors. PMI/HIWIN/THK track guides provide high positioning accuracy, high repeatability and durability. Linear guides provide smooth movement of the trolley thanks to the use of rolling elements – beads or rolls. The difference between static and dynamic rolling resistance is very small, so that the force needed to start up is only slightly higher than the force supporting the movement. That is why the stick-slip effects in Weni brand lasers do not occur. Omron Corporation is a world automation leader. It provides different products and services in the field of industrial automation and electronic components. The Omron company with the seat in Kioto in Japan has its branches in Singapore, Hong-Kong, Amsterdam and Chicago. The company employs over 37,000 people in 36 countries. Advanced CW-6200 chiller is a device designed to ensure the optimum operating temperature of both the generator and the laser head. Advanced automatics used in our chillers enable to control the temperature of coolant precisely. Built-in alarm system informs the user about the exceeded of permissible work temperature, as well as the disruption in the flow of the cooling liquid.